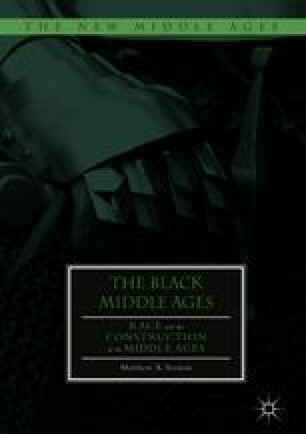 This chapter proceeds with a consideration of a set of medieval texts that raise questions about how the Middle Ages were being constructed and mythologized within the period itself. This chapter provides a vital counterpart to the argument constructed over Chaps. 2 and 3 that are premised upon finding latent ambiguities and ambivalences within medieval narratives. In this chapter Vernon discusses how post-colonial readings can critically intervene into interpretations of Gerald of Wales’ The History and Topography of Ireland and The Conquest of Ireland. This reading foregrounds the flexibility inherent within Geoffrey’s text. The History of the Kings of Britain was not just popular in its own time, the descriptions of Arthur and his linkage between the progress of history and genealogy would form the basis of many later iterations of the Arthurian legend. The most significant of these would be those produced by Sir Walter Scott, who was a vital conduit for American medievalisms throughout the nineteenth century. Calling for more complex responses than the squeamishness evident in contemporary distaste for enlightened discussions of “race,” these discomforting writings communicate ways that the consolidation of modern raciology required enlightenment and myth to be intertwined. Indeed, they reveal theories of culture, “race” and nation as supplying the logic and mechanism of their dangerous interconnection. Paul Gilroy, Between Camps: Nations, Cultures and the Allure of Race, 2nd edition (New York: Routledge, 2004), 59.